This past weekend was spent in San Diego. 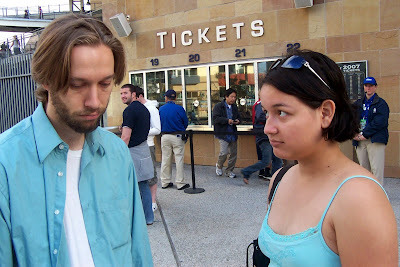 I kind of seemed like a vacation as Flor and I did pretty much only leisurely things including many "touristy" things that San Diego has to offer. Friday night we took off in the late afternoon with my roommate Sir Aaron Riveroll on a quest to secure last minute tickets to the Padres game against the Red Sox. Unfortunately our quest was denied because the game had been sold out for weeks. Anyway, since we were downtown we decided to meet up with Doug Downing for a little Doner Kabab from the newly installed Kebab Shop. Man those things are good. The last time I had a kebab was 6 years ago when I was in Vienna... living with Doug... ahh, good times. Saturday, Flor and I headed out for our first ever golfing trip together. 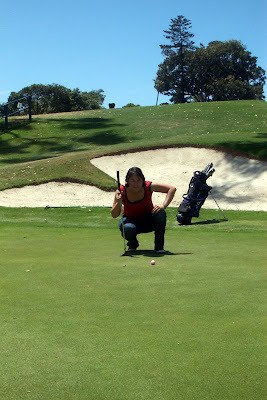 Flor had never golfed before so I thought I'd show her how it was done. Kelly joined us for a quick nine holes and then we met the Trager's for a late lunch at Wine Steals. Mmmm, pizza at a wine bar. Who knew? We had a great time and I played a marvelous round of 41 on a par 27. That translates to a 109 for a par 72 course. For me that was great! I also was able to catch this awesome action shot of Flor. Priceless.